You can purchase the 41-page unit for The Mysterious Benedict Society by Trenton Lee Stewart NOW for immediate download for only $19.95! Includes a Jeopardy-type game. from Kids Wings at Teachers Pay Teachers. "Several years ago, in the course of my research on the human brain, it came to my attention that messages were being delivered to people all across the world--delivered, I should say, quite without their knowledge. The messages were going directly into people's minds, which absorbed them not without knowing where the messages came from, but without realizing they had received or read anything at all. I believe these messages are the source of the phenomenon commonly known as the Emergency." The Mysterious Benedict Society. The Emergency had everyone worried. People were disappearing. The government, school systems, the budget, the weather were all in a mess. Crime was rampant. Citizens clamored for improvement in government. One person knew why. Another person knew what to do about it and started by putting an ad in the newspaper. The curious ad in the newspaper offered a gifted child "special opportunities." It caught the eye of Reynie, a gifted young orphan who was greatly in need of challenge and higher level learning. The first step in choosing a team that qualified to receive the special opportunity was a series of clever tests and problem solving tasks. Would Reynie win the opportunity to join the odd collection of gifted children? Would he have the courage to face the terrifying and dangerous plan that only children could possibly carry out to save the world? Would the Mysterious Benedict Society have the talent and resources to be able put a stop to the Emergency? The Mysterious Benedict Society is a novel in which the world is threatened by an evil, mind-controlling power. A team of gifted kids are the only ones who can break the code and stop the destruction by solving a series of puzzles, code, and tests. Will they be successful? Awesome Analogies --Try to beat your friend in finishing an analogy! A 42-page unit, perfect for lesson planning and handouts or projection on your SmartBoard for The Mysterious Benedict Society is now available! Crossword Puzzle: Who's Who and What's What at the Institute? Research: Advertising to prove "If you stand for nothing, you'll fall for anything." Purchase this awesome literature guide and Jeopardy-type game NOW! The Mysterious Benedict Society is included in the Kids Wings Tempests and Teamwork Collection of literature guides for award-winning novels and intermediate-level picture books. Our Tempests and Teamwork package includes a site license for one school, a spiral bound book, and CD containing 29 titles with over 700 pages of activities, nine "Jeopardy-type" games, Karoke-type songs, and professionally recorded songs! 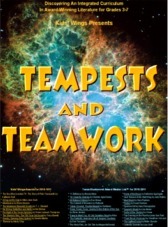 You can purchase a literature guide individually for around $19.95, but if you order Tempests and Teamwork, you can get 29 literature guides for only $25, or less than $1 each! This is probably the greatest bargain in the USA, as long as quantities last! Buy The Mysterious Benedict Society by Trenton Lee Stewart NOW!